At the start of June the LIGO team announced that they had made the third firm detection of gravitational waves from the merger of two black holes. This latest detection, from the second observing run, adds to the collection of massive binary black holes detected by LIGO. 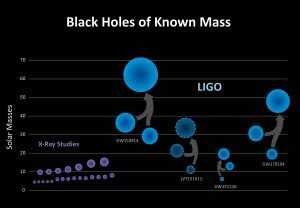 One of the things that can be determined from LIGO’s measurements is the speed and spin of the black holes relative to the direction in which they orbit around each other. That can imply how the two black holes came to be together. To learn more I spoke to Dr Laura Nuttall, a researcher here in the Gravitational Physics group here in Cardiff. I also spoke to Dr Annabel Cartwright, a lecturer here in Cardiff, who has developed a hypothesis relating to the evolution of life on Earth. Specifically, Annabel’s “Venus Hypothesis” relates to the Cambrian Explosion, a period around 500 million years ago when the number and variety of species present on Earth expanded in a way never seen before or since. Annabel hypothesises that life may have come to Earth from Venus following a period of intense volcanic activity on our sister planet. It’s an interesting hypothesis, and one which may well develop further over coming months and years. An extended edition of an original broadcast on 28th June 2017 as part of Pythagoras’ Trousers on Radio Cardiff.